If you are looking for a Pulpit Robe or Bishop's Attire, you need to look no further because Murphy Robes offer the most extensive selection of robes available with styles ranging from the classic Geneva to the contemporary Evangelical Cassock. Styles are available for men, women or both men and women. Women's Robes are also appropriate for soloists. 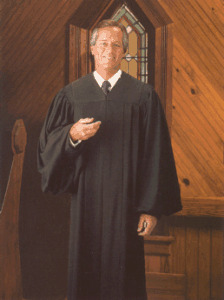 Murphy's Qwick-Ship robes are shipped from the factory within 24 hours of our receipt of your order. And there's no extra charge for this "qwick" service! In addition, all items are backed by Murphy's guarantee of satisfaction. If you're not completely satisfied with any item you order from us, simply return it (unused and unworn) within ten (10) days of receipt for an exchange or refund. 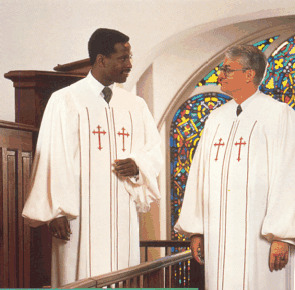 The "S-Series" pulpit robes noted below are kept in stock in over 100 different sizes. They are stocked to fit men with chest measurements of 38" to 52", sleeve lengths 32" to 36", and heights of 5'6" to 6'4", with a floor clearance of 8". Selected styles are also stocked for women with chest measurement of 36" to 48", sleeve lengths 29" to 33", and heights of 5'6" and up, with a floor clearance of 6" to 8". Murphy's Hotline H-styles introduce the latest trends in styles and fabrics for pastors and are indicated by the letter "H" following a style name. Hotline robes are stocked in 20 sizes to fit men, with selected styles for women also available in 16 sizes.